Length of employment: Varies by base, but in general April 20 to September 15. Pre and post season extensions are not uncommon as they will be a direct result of the wildfire danger during these shoulder seasons. The Airtanker Base Loader reports to the Airtanker Base Supervisor and will be placed at one of 14 Airtanker Bases located around the province. 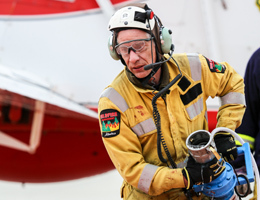 The loader position is the Airtanker Base’s front line worker whose primary responsibility is the safe and efficient loading of airtanker aircraft used in the suppression of wildfire. Working under the direction of the Airtanker Base Supervisor, the loader will also be required to assist in base operations, which include maintaining inventory levels, base maintenance and safety. This position requires skills in effective communication, organization, maintenance and mechanical skills. The applicant has to have an ability to prioritize, multi task, as well as a commitment to work long and flexible hours when required. Aptitude with pumps systems, chemical handling and safety around aircraft is essential. Some high school education plus some related experience (i.e. up to 12 months). Special Requirement: Physically able to perform position duties. Completion of a fitness test will be a requirement of this position. Ensure appropriate PPE is worn while working on the base. All accidents, incidents and near misses will be reported. Assist in safety orientations for all personnel entering the base. Conduct facility and grounds maintenance as directed by supervisor. Housekeeping of operations building(s) as required. Facilitate the requirements of the airtanker group. i.e. aircraft spares storage, assisting in setting up accommodations and vehicle rentals as needed, etc. Report daily to the ATBS for a briefing as to the general fire situation and the plan of action. Ensure the loading area itself is being properly maintained, is clean and is in a safe condition. Maintain the loading/mixing/storage areas so that they are clean and free of obstructions. Ensure that the fire retardant, foam concentrate is stored, protected and re-circulated to ensure it will continually meet specifications. Measuring inventory levels to ensure there is adequate supply of foam, retardant and water to support normal operations, and reporting those levels to the Airtanker Base Supervisor. Ensure that the material, supplies and equipment are not placed or stored in locations that may interfere with the fuelling or fire retardant loading procedures. Receiving of inventories and ensuring their proper storage as they arrive on base. Loading of aircraft as directed by Airtanker Base Supervisor and Pilot in Command. Ensure testing of retardant is preformed as per policy. Maintain records of the amount of fire retardant used and stored. In conjunction with, and under the supervision of, the Airtanker Base Supervisor, carry out aviation fuel quality testing as per Standard Operating Procedures. Carry out physical measurement of fuel inventory levels. Schedules between Areas will vary however you can generally expect to work; 10 on and 4 days off, however 5/2 and 15/6 schedules are possible as well. Talk to the local office for specific information on this topic. In most Forestry Areas living accommodations can be provided. Please contact the Forestry Area directly for information on accommodation type and availability. Both on-the-job and specific training will be provided. Candidates will be required to attend and pass; WHIMIS, TDG Ground and Forklift courses. Primarily you will be working at an assigned base located at the local airport. However, depending on the level of active air operations in the province at any given time, individuals may be asked to relieve other airtanker base staff in another location, and also there are sometimes requirements for experienced personnel to work on temporary bases set up at various locations around the province. This may also include mobile retardant bases set up to facilitate helicopter retardant bucketing operations.